Of all the stories of chefs who have left corporate jobs to pursue a passion for food – and there are many – the circumstances behind Ben Chapman's move into restaurants seems one of the least likely. A few years ago, a young Chapman, who was at the time "working in music, graphic design and then interiors for restaurants," was standing in a restaurant he'd designed that had just finished being built. "The landlord came by and said, 'Have you seen this little site we've got three doors down the road? '," Chapman recounts. "I went and had a look at it, and as soon as I walked in it was quite obvious that it needed to be Smoking Goat." Throughout his short career, Chapman has stood out as exemplary for working with British farmers and employing a truly nose-to-tail and whole-farm philosophy. "When you think of farm-to-table you always think of two sprigs of sorrel and an emulsion over the top. But that," he says about his lardo fried rice, a dish that was developed as a way to use excess fat from the pigs on a farm he works closely with, "is a proper farm-to-table dish." 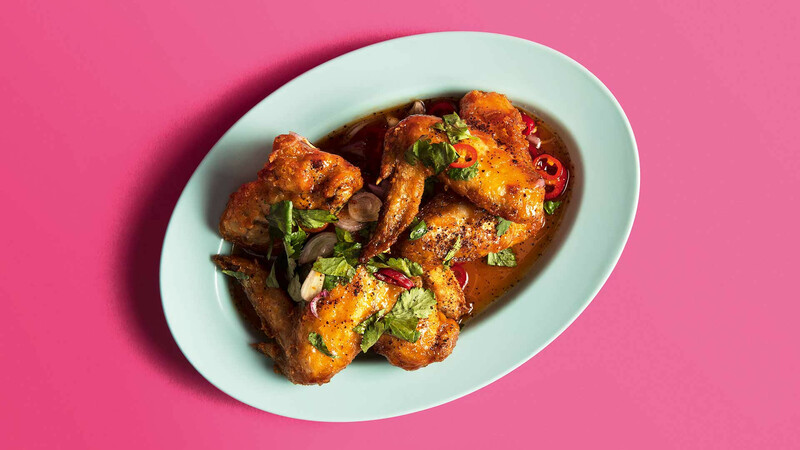 As for the Thai influence, "I had a meal in a place called Pok Pok in New York with a friend, Andy Oliver, who went on to open a restaurant called Som Saa. I just thought the food was amazing and I'd never really tasted anything like that. I'd been interested in food but I found the idea of kitchens to be a bit of an impenetrable area to go into if you didn't have a culinary background. 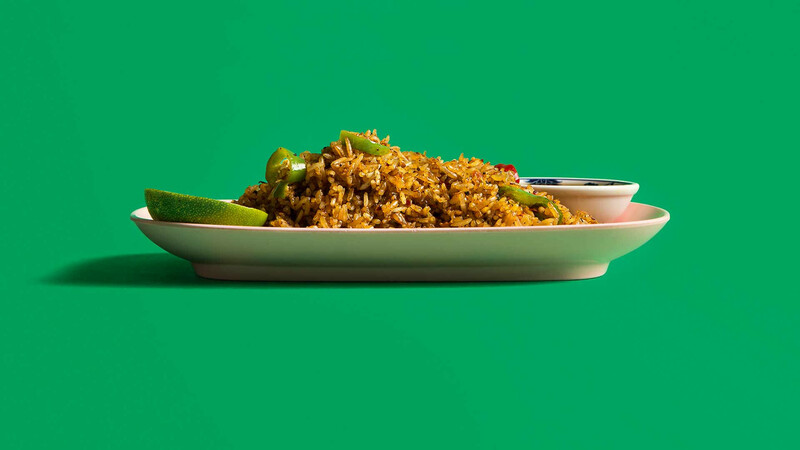 So I guess with Thai food, as soon as I got a little bit of the idea as to what makes things nice and why they taste that way, it all started to slot in." After travelling around Thailand (something he and his team still do regularly), he opened the first iteration of Smoking Goat in Soho. "We got it for six months and I thought I'd do three or four Thai dishes. 'It doesn't matter, no one's going to come anyway,' I thought. It didn't really end up that way." 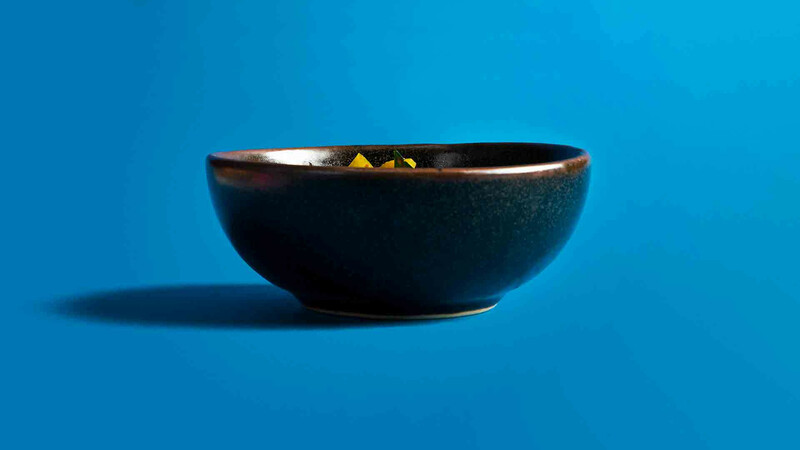 The original Smoking Goat has since upped sticks to a bigger site in Shoreditch, while Kiln, which focuses on clay-baked Thai dishes, opened to similar acclaim last year. 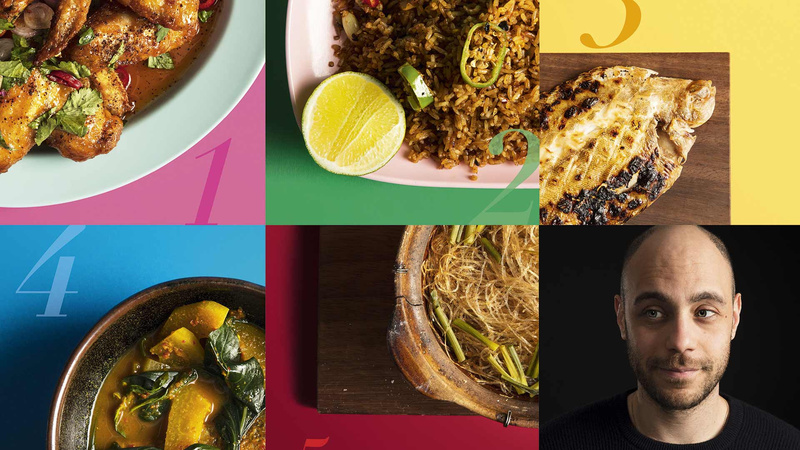 His five dishes each, in their own way, tell the story of a chef who refuses to be pigeonholed. "I ummed and ahhed about putting these in, to be honest. 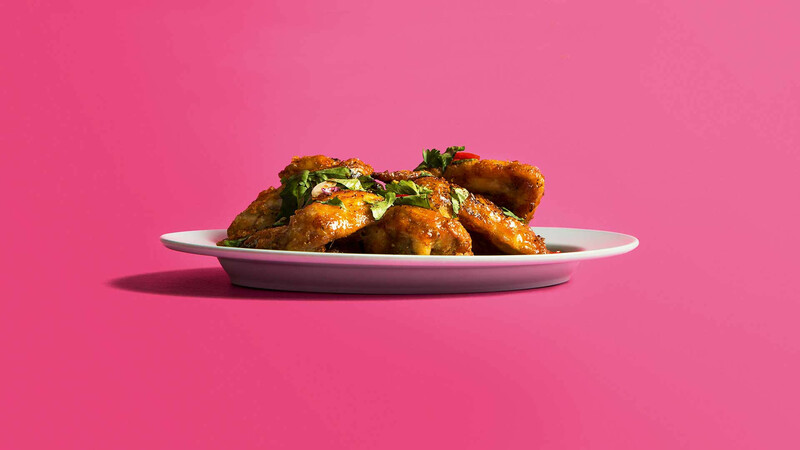 I basically nicked them from Pok Pok in New York, but just changed the technique a little bit. They're a Vietnamese dish, they're not even Thai. Personally I think I think they're too sweet, I don't like them, but everybody else loves them. I wouldn't be sitting here today unless I'd done that, and I guess that's the thing about restaurants and that's why I wanted to include this dish – it's not a perfect conception. The first time you eat them they are delicious, but by now I've fried thousands of them. I tried to take them off the menu at the new restaurant, but it wasn't happening. It's just an interesting dish to me because they really were the foundation of allowing us – me and the other guys that I work with – to go and learn how to do this restaurant thing properly. They gave us the room to do that because people were coming in, eating wings and drinking beers and having a good time. And if they didn't do that then the restaurant would have shut after three months." "The reason we have this dish is because we work with a pig farmer called Fred Price in Somerset. He's a very progressive young arable farmer of the type that we need in this country. The cover crop he uses is an organic chicory mix which he can then feed to the pigs. So the pigs can move around this huge amount of land, with a positive impact on the soil, which has created a huge amount of value for us at the table because the quality of flavour that you're going to get in a pig like that is stratospherically different to a pig that's been inside and fed on a mixed grain. We kind of committed to taking all the pigs he can raise, which is great in theory, but you have to be able to use the whole pig, and the big thing for us was trying to work out how to use a lot of the fat. We were down in the fields there with him on one of our chef visits, and one of the guys popped his head up and said, "Why don't you just do lardo fried rice?" It's a dish that's tasty as hell, but the main reason it's there is so we can support this progressive type of farming." "When you make a curry with someone in the east of Thailand's Isan region, they just take turmeric out of the ground, pound it with garlic, and take a kaffir from the tree – I don't care what anybody says, you definitely lose some quality of flavour the second those things are processed. Immediacy and brightness – for me, those are the two lasting characteristics of eating in Thailand. When people ask, "Is your food authentic?" 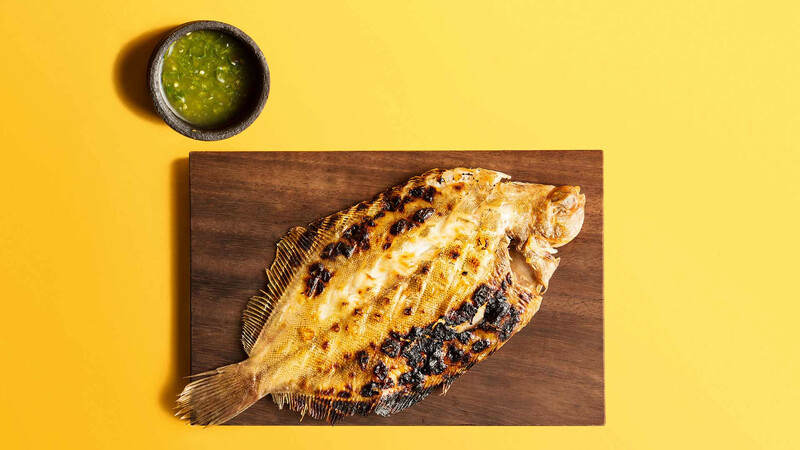 then I say, if you're looking for something that has the spirit of what the food I like out there is all about, then a dish like this fish is absolutely perfect. The fish is from a supplier in Cornwall called Kernow Sashimi, who are just about exceptional handling all the way through. It's all sashimi-grade fish that's landed by around 2pm and by midday the next day you're eating it. 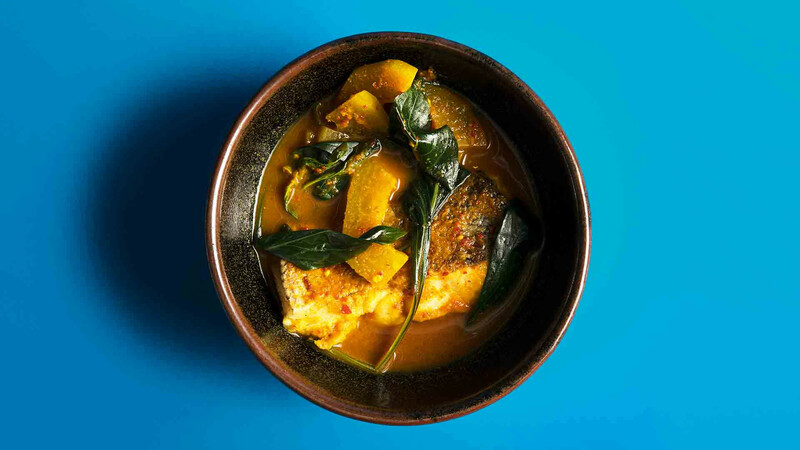 This dish is literally just a fish with some salt on it, and to me that's just as traditionally Thai as a dish that has 25 ingredients, because in rural areas where they can keep it simple, they absolutely will." "When we were opening Kiln, I remember being so nervous about whether anyone was going to like it at all. I just didn't know if this food that I'd seen and liked when I was abroad would appeal, and if anyone was going to get it. Will anyone actually order a sour curry? I'd been out there eating these things for months so I was into it, but I had that fear that the first time someone walked in the door, they'd think, 'why would I want to eat that?' It's a southern-style curry; very spicy, with a very thin consistency. 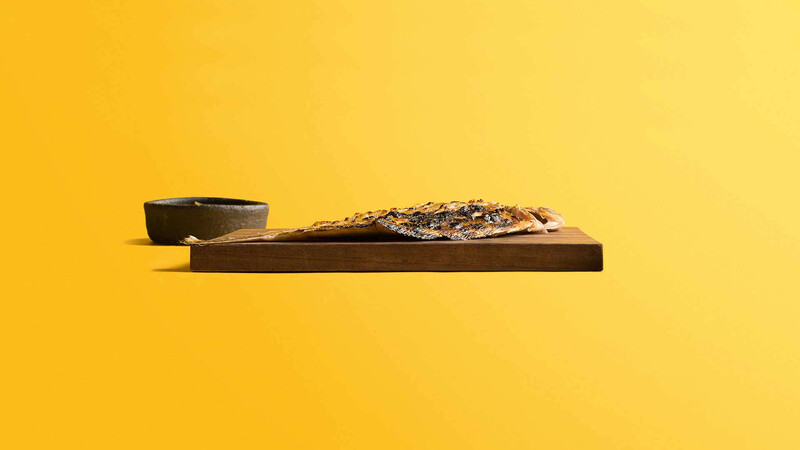 It's pungent with a lot of fermented fish sauces, but it's also subtle – it doesn't have that big coconut cream flavour that people often like, or that contrapposto of sour and sweet. It's been on the menu from day one at Kiln, and every time I see it I'm really proud that people actually like it. It just reminds me of when I was scared shitless that everyone was going to come in and walk out – now everyone's getting on with sour curries and all kinds of weird things." "Poo Ob Woon Sen is an iconic dish for Kiln, and it's the one I knew I had to get right before we opened. I owe it a lot, really. 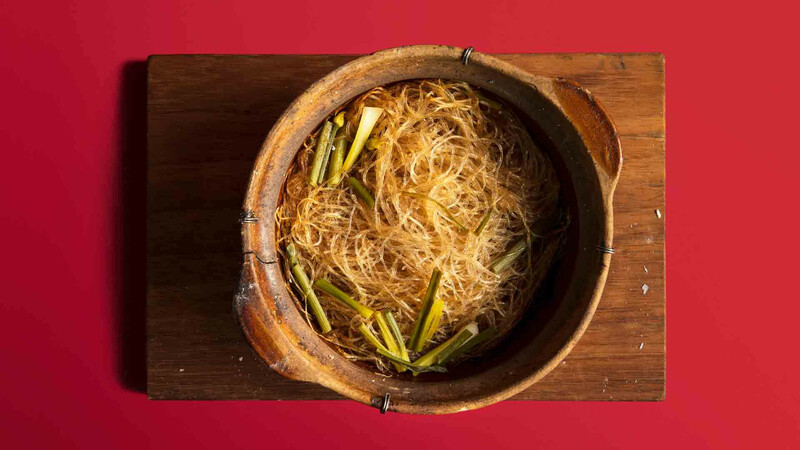 It's crab-baked glass noodles, always with pork belly at the bottom and a mung bean-style noodle, all put in a clay pot with some soy sauces. 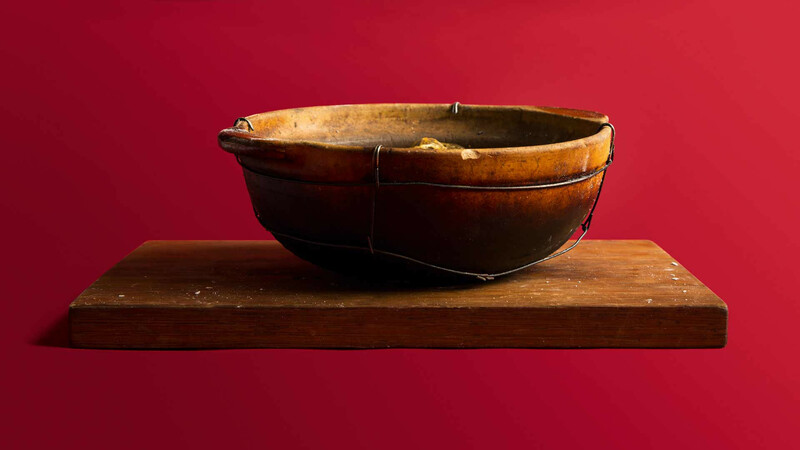 We use brown crab meat and roast it with celery leaf, straight on the fire in a clay pot, and then it goes to the table, you take the lid off, and you take in the aroma of the dish. It's interesting to think that this is a dish that's savoured as much for its aroma as its flavour, which blew my mind when I first heard about it. 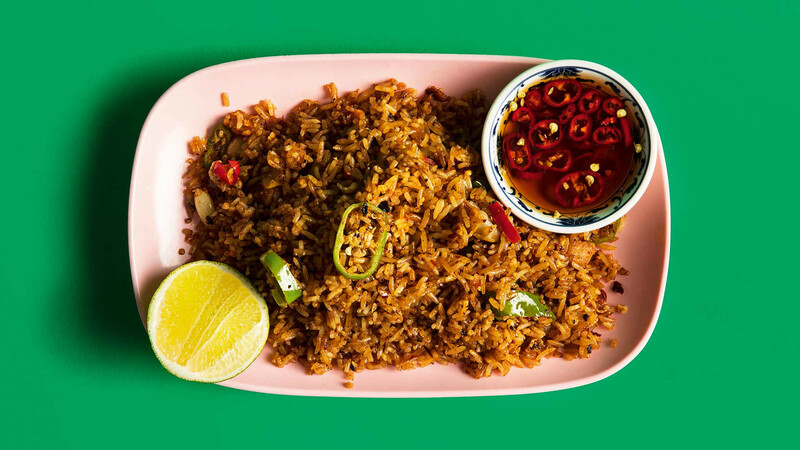 It's a really satisfying thing to eat – a classic combination of Thai and Chinese – and it's one of those dishes that's the backbone of us being able to do all of the mental things we do on the rest of the menu, and it makes the restaurant make sense."